Motorized Standard Duty Unit includes a 2in. customized die plate clip. Remove the installed clip and you can convert almost any hand-held seal to a simple 2-3 second rocker switch operation . 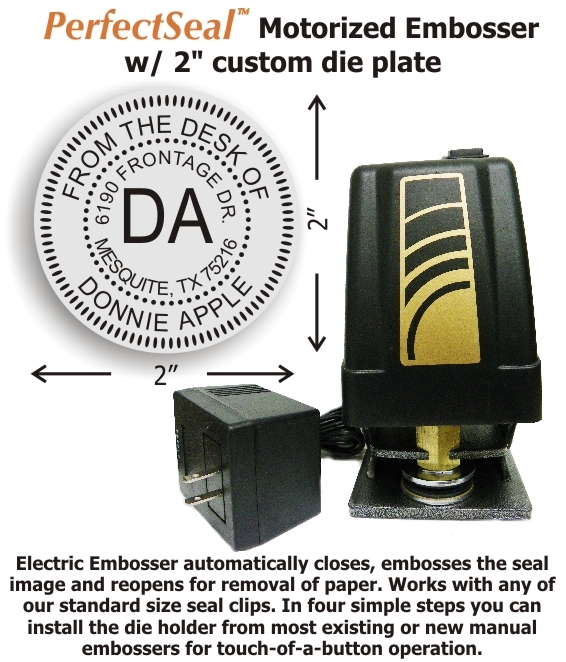 Designed for 1 sheet of 24lb paper at-a-time embossing, this device can accommodate most seal clips on the market today (not intended for long-reach or extra long-reach clips!). Quick change allows multiple images to be embossed by one Motorized unit. Impression reach is the same as as our Deluxe model (1-3/4in.). Separate embossing die clips can be manufactured for an additional charge (see offer below). Unit tested to 20,000+ use as directed impressions. Mfg's Warranty - 12mos. 120vac Wt. 8lbs.